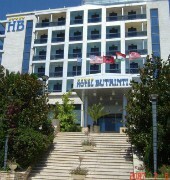 Butrinti Hotel is a five-star property located in Sarande area, at the southern end of the bay, close to some of the most interesting sites of South Albania, such as the citadel, the archeological site of Butrint and Phoenike, the Mesopotam Church and the “Blue Eye” Spring. Each air-conditioned guestroom is fitted with balcony and furnished with satellite television, refrigerator/mini bar, hair dryer, direct dial telephone, work desk, safe deposit box and en suite bathroom with shower. Dining option includes a restaurant serving international and traditional Albanian dishes and the bar that serves a wide selection of refreshing beverages and snacks. Leisure and wellness facilities include a health club with modern equipment, an outdoor swimming pool, sauna, spa and a tennis court. Additional featured services also include a 24-hour front desk, currency exchange, high speed internet access, lift access and complimentary car parking onsite.